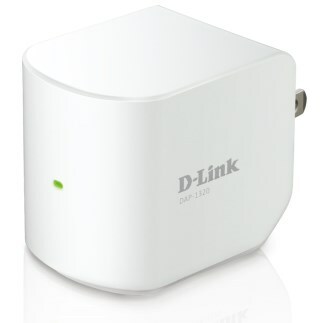 D-Link introduces the push-button Wireless Range Extender (DAP-1320), a compact device designed to extend your WiFi signal. The product has a MSRP of $49.99 and is immediately available. Designed to extend an existing wireless network to the farthest corners of a home, small office or even the backyard, D-Link today announced the push-button Wireless Range Extender (DAP-1320). The compact and ultra-portable Wireless Range Extender is ideal for pushing wireless signals to those hard-to-reach areas – eliminating Wi-Fi dead zones and broadening the range of a wireless network for seamless everyday Internet activities such as emailing, chatting, music, video streaming, and VoIP calling. Delivering speeds of up to 300Mbps, the Wireless Range Extender expands network connectivity to wireless devices such as laptops, smartphones and tablets, offering fast web-browsing, smooth online gaming, uninterrupted music and video streaming, fast downloading/uploading speeds, and Skype or Facetime calls without any lag time or glitches. The device is equipped with Wireless N technology and uses multiple intelligent antennas to maximize the speed and range of 2.4 GHz Wi-Fi signals to significantly outperform previous-generation Wireless G devices. The antennas make use of a home’s environment by bouncing multiple wireless signals off walls and ceilings to work around obstructions and help eliminate dead spots. In addition, the Wireless Range Extender features a simple one-button installation and is universally compatible with all wireless brands[i] for added flexibility. Simply press the WPS button on the existing router and then on the Wireless Range Extender to sync and instantly increase the coverage of a wireless home network.